This thin chisel is wrought in the shape of a stylized finger, with a perpetually flaking lacquer of dark green. It cannot be broken save by magical force of some kind. Use of the chisel will speed normal chiseling tasks by about 25%. It can be used to chisel a message or glyph into an individual's flesh, an extraordinarily painful process - however the resulting symbols can only be seen under a waxing or full moon. It is said that with the right rituals, the viewing conditions can be changed (so that the message might only be viewable with infravision, for example). This strange item is a hollow fist with several contradictory legends. There seems to be consensus that it was created by the sorceress Inaya the Seeker. Some say that it is to be used as a drinking vessel, and that drinking a cup of wine will imbue the drinker with great strength. There are also whispers of those who drank the blood of their foes - or their friends -from the fist and gained strange powers. These rumors have become stronger in the wake of the Forsaken War, given the horrific acts of the Awlad-i-Dimagh. Others say that these legends are nonsense and that the fist is to be worn as a (very heavy) amulet. Calling out a name of a deity of the Many ("Ouathar") is supposed to reveal all magics within sight of the bearer, and that the Fist is able to store spells and magics within it for later use. 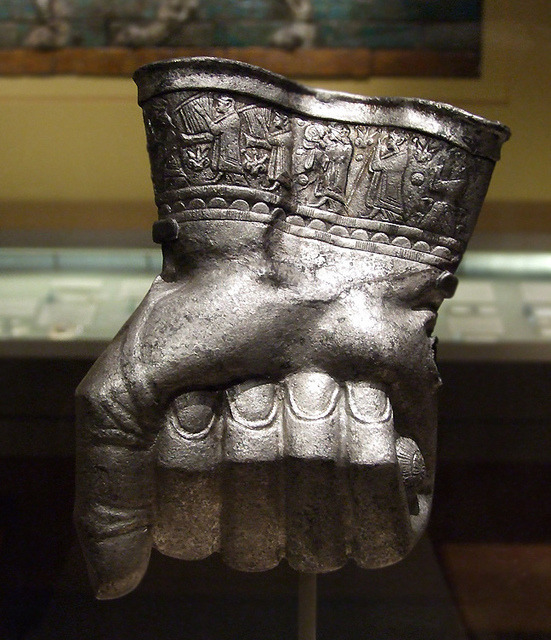 Still others insist that the Silver Fist is to be worn as a glove, that it can be used to strike the insubstantial and to unleash bursts of force upon striking a foe, knocking them back. Plate mail is exceedingly uncommon in the environs of Sanctuary, because of the fatigue and discomfort that generally accompany the armor. The Rimeplate is an exception to this general rule. A suit of glimmering blue-tinged plate, the Rimeplate is cold to the touch. If someone actually puts on the armor, they feel a freezing chill throughout their bones as the armor's magic activates, and frost actually begins to form on the edges of the armor. If donned, a wearer loses all Dex bonus and is at -1 to all attacks and -2 to all saves from the cold, but the Rimeplate is AC 1 (or 19 if you prefer) and prevents any distress rolls due to hot weather conditions. If an enemy attack hits and would deal max damage, it must be rerolled once. At one point, the Rimeplate was in the hands of Caliph Perviz IV, who reportedly made one of his bodyguards wear the armor at all times, just in case the Caliph ever wanted a cold drink. 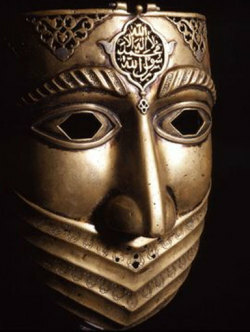 This war mask has been held for many years by marabouts of al-Kursi, one of the ribats located on the trade route back to the Imperial corelands. Passed down from one champion of the order to the next, the mask is said to have gazed upon countless conflicts and battlefields, even dating back to the time of the Bieth themselves. The countless battlefields of slaughter that the mask has seen have imbued it with a deep knowledge of war; once per day its wearer may reroll an attack or damage roll that they have made, or that was directed at them. If facing an unclean spirit or skinchanger, the holy verses inscribed on the forehead of the mask will glow a brilliant white, and the wearer will be able to strike more punishing blows at the being (reroll 1s on damage dice). However, in its zeal to strike down the foe, the mask urges its wearer into the fray; they must save vs spell in order to break away from a foe who they have engaged in melee combat. It also grants an extra saving throw against the first effect of the Zone its wearer encounters in a day. After using the mask for approximately a week, the wearer's features will start to resemble the metallic features of the mask; their mouth will not disappear, but will start to conform to the v's of the mask's stylized beard. The wearer's dreams will always include battle.